3600 - 3699, 3700 - 3799, 4600 - 4699 and 9600 - 9682. 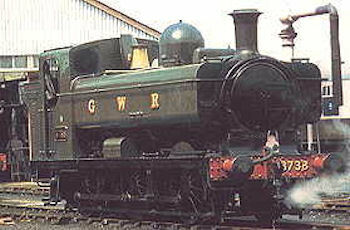 1949 (9673 - 9682 produced by GWR, Swindon) to lot number 378. 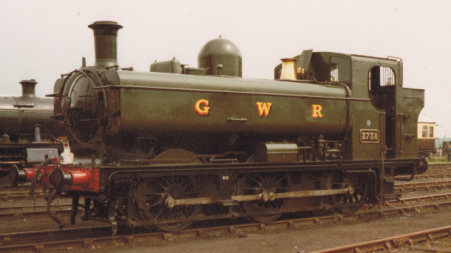 The '5700' class of light goods and shunting engines were the largest of any one class produced for the GWR totalling 863 locomotives. The class was designed to replace the 0 - 6 - 0 saddle and pannier tanks of the '2700', '1854' and '1813' classes together with other smaller classes, many of which dated back to the 1880's. They were similar to '2721' class introduced in 1897 except for the use of Belpaire fireboxes, closed cabs and large extended bunker. Very few alterations were made to the design of the class throughout its production life, but the most noticeable change was to the shape of the cab. Locomotives produced after 1933 had the cab backplate blended into the cab sides, prior to this date the backplate ran vertically from the roof corner. This change also brought about a new style of oblong cab window to the front and rear instead the the plain round design, and additionally, the cab roof to track height was increased from 11 feet 4 5/8 inches to 11 feet 11½ inches. One small separate series within the class were numbers 9700 to 9710 as these were locomotives fitted with condensing gear for working the meat traffic over London's Metropolitan line to Smithfield market. A prototype was built in 1932 from engine number 8700 with pannier tanks of reduced length so that the recirculating Weir pump and associated pipework could be installed. After a year on trial, the only modification needed for the production of the small class was an increase in the water capacity. The shape of the tanks was altered to join with the running plate at the rear increasing capacity to 1250 gallons. The prototype was modified to this design and renumbered 9700. A replacement for 8700 was built in 1934 by GWR Swindon. 13 engines of the class received spark arresting chimneys as these engines worked in military depots. Most of the 5700, 6700, 7700 and 8700 series were withdrawn between 1957 and 1962 whereas the 9700 and 3700 series were mostly withdrawn in 1963 to 1964. The withdrawals of the 3600, 4600 and 9600 series occurred in 1964 to 1965. The group that had the shortest working life were the last series of 6750 to 6779, an example of which is number 6771, built in October 1950 and withdrawn March 1958. 13 withdrawn locomotives were bought by London Transport and some also by the National Coal Board which prolonged their valuable careers although it is interesting to note that these examples were those built by outside contractors plus the first fifty built by the GWR. 16 examples of the '5700' class are lovingly preserved and they are numbers 3650, 3738, 4612, 5764, 5775, 5786, 7714, 7715, 7752, 7754, 7760, 9600, 9629, 9642, 9681 and 9682.